"Here's the thing. Christians seem to think that because the Bible is inspired, all of it should be taken literally." I finally got around to reading this book. I know I was late to the game, but better late than never, right? If you're not familiar with Rachel Held Evans, where have you been? Just kidding. She is a biggie in the Christian blogging world and I know that one piece that got her a lot of attention was during the Chick-fil-a debacle awhile back. This is her second book, her first being Evolving in Monkey Town. As you may or may not know, a couple of years ago I read the book The Year of Living Biblically and just raved about how interesting, educational, and funny the whole thing was so I expected to really like this book as well. I realize it's not completely fair to compare the two (but I'm going to do it anyway!) because her perspective is coming from an actual practicing Christian woman instead of a secular Jewish man. His intent was to write something that would end up being mostly funny with some education about Jewish and Christian sects (it ended up being phenomenally thought-provoking). Evans' intent was clearly to make a point about how many supposedly biblical ideas about women are wrong. I got the impression from the beginning it was a bit self-serving. 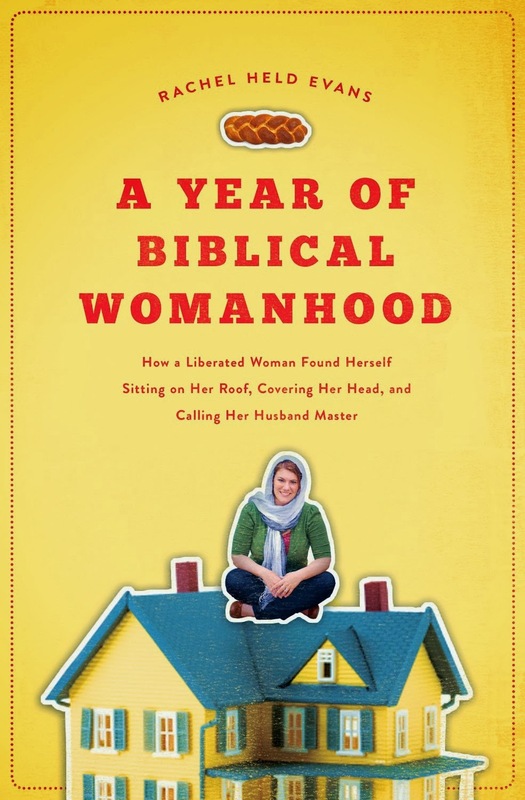 Self-serving in the sense that she really needed some topic to write a book about to pay the bills (duh), but also in that she had already come to her conclusion that conservative ideas about "biblical womanhood" were pretty much wrong. "I think I was looking for permission--permission to lead, permission to speak, permission to find my identity in something other than my roles, permission to be myself, permission to be a woman." I really felt like she should have come at the project from a greater willingness to see another perspective instead of an attitude that this next thing she was doing was going to obviously be absurd. Even though I don't actually think she was wrong about the conclusions she was trying to prove from the beginning, I always think we are doing it backwards when we come up with our own truth about a subject and then go to the Bible to find evidence of it. I also felt like in many ways she wasn't trying hard enough to really live these biblical mandates. I felt like she whined a lot about her project when a lot of the things she was doing really weren't that bad. Obviously she had a different plan about how she was doing this since there were specific items she wanted to focus on (like being away from her husband during her period) or instead using abstract, immeasurable virtues (gentleness, domesticity) instead of just kind of rigidly following every command in the Bible the way Jacobs did. His way may have been more fun for the reader, but again, their intents for the books were different. I think it would have been easier for me to wholeheartedly enjoy the book if I had never read Jacobs' book because I would not have had a certain set of expectations and wouldn't have spent the whole time comparing the two. Perhaps my expectations for the book were unrealistic, influenced too strongly by Jacobs' book. I did really appreciate the way that Evans included a lot of back-story on the text and did consult individuals with different backgrounds (Jewish, Amish), but I felt like she could have had some more and better information from leaders the way that Jacobs did. (Then again, many of his consults were men and hers were women and perhaps that was harder to find or would have defeated the purpose?) I guess I just felt like the research could have been better. Other parts I really liked were her section on Mary and her trip to the monastery. I thought she was respectful of Catholic beliefs in the way that she acknowledged her thinking was different. I also think she makes a good point about how much of the evangelical "biblical womanhood" franchise is not really based in biblical texts and comes a bit more from an idealized American culture (again, another post). This is true for a lot of the pressure in evangelical culture to be a certain way--it's not as much "Christian" as it is "American". And we need to realize this. "Caring for the poor, resting on the Sabbath, showing hospitality and keeping the home--these are important things that can lead us to God, but God is not contained in them." "Some rabbis say that, at birth, we are each tied to God with a string, and that every time we sin, the string breaks. To those who repent of their sins, especially in the days of Rosh Hashanah, God sends the angel Gabriel to make knots in the string, so that the humble and contrite are once again tied to God.....the rabbis like to say, a string with many knots is shorter than one without knots." In the end, I guess I just felt like it could have been better. What were her ultimate conclusions? It seemed unclear to me. Were experiences left out? I was able to clearly see changes in Jacobs' and how they took place. It just never felt like Evans was as deeply involved or surrendering as completely to total immersion (which I suppose she couldn't because of her choice to be more abstract). It almost seemed to me like I was reading an earlier draft of the book, not the final copy. (Is it possible the Kindle version contained more errors than just several general typos?) However, here's the thing: it's not the best bookI have read, but I want others to read it because I want to know what emotions, thoughts and ideas it conjures up in them. Sometimes we feel that way about books. We don't want someone to read it because we think everything about it is perfect--we just want to know what it made them think and feel. I want to know what Catholics think about her conclusions. I want to know what conservative evangelicals have to say about her historical context and explanations of origins of words. (I especially want to share the exploration of the "virtuous woman"!) Unfortunately, I don't think she's likely to reach as many conservative women as she would have liked because she did not embrace that lifestyle as much as she could have and with as much humility and open-mindedness as she could have. And Rachel Held Evans, if you somehow found this, I hope you don't take it personally and please know that I still think you are Eshet chayil! I hope you will read it, Patty. I'd love to discuss!